Before i started up my blog the only time i really used my laptop, was of a night time whilst laying in bed watching Pretty Little Liars on Netflix and i would always end up falling asleep & waking up with the laptop on the bed next to me. 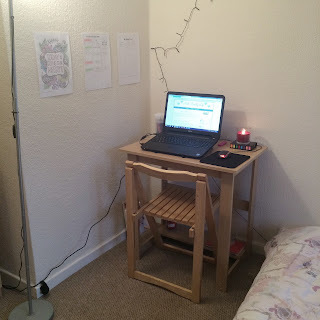 Since i started blogging properly though and really planning out everything that needed to be done, I felt i needed some sort of desk space in my room where i could sit down of a night and just type away, write away and print stuff out. So i decided to make the area where my drawers once were into the desk area that i so wanted. And this is how it came about, the picture below is before i even brought the desk, but i will go into more detail further on in the post. So as you can see, it all looked a bit messy with a set of 4 drawers with a mirror balanced on top of it that just don't match in the slightest bit at all. On top of the drawers is my external hard drive (which is full of pictures that will be forever memory's), I think there was then a strip of painkillers, moisturiser, a koala bear thing from Australia, hairspray, tea tree oil, vicks, some back spray thing and then a load of paper work. Down the sides was just more paperwork, a load of magazines and my bluetooth speaker....so basically just a general load of crap that didn't have its own space, I wont even go into how much crap is in the first 2 drawers haha. I then did a bit of searching around on the Internet as i wanted a desk that matched my drawers, but i also didn't want to spend loads of money on one. I came across this Desk on the Argos website and for £14.99 i thought it was quite a good deal. But my god it was hard to put together, it took me a couple of hours to do and I also ended up pulling a muscle in the top of my arm and am now currently in a lot of pain with it. But the picture below is the finished result of what it looks like now that I've got the area all set up. As you can probably tell straight away it looks so much tidier, the chair didn't come with the desk i borrowed that from our table down in the front room just until i buy a different one. This little area still isn't exactly how i would like it but its getting there slowly. So on my desk i have my laptop (obviously), the laptop i have is by Dell not sure of the exact make as the box is in a cupboard somewhere. Behind the laptop i just have 2 clear pots which one holds colouring pens and the other holds colouring pencils, I then have a black sticky notes case which just holds coloured sticky notes incase i ever need to jot something down quickly. On top of that is my favourite candles at the moment which are the Strawberry & Pomegranate candles from Morrison's and a pink lighter next to it. Then i just have my mouse & mouse pad as i prefer to use this rather than the actual mouse pad on the laptop. 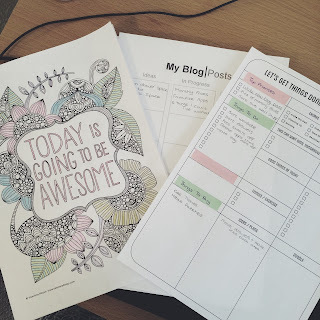 Then on the wall i just have a poster that I've nearly finished colouring in that says "Today Is Going To Be Awesome" which i love the saying of, I also have my "Things To Get Done" list, aswell as a "My Blog Posts" list....i do love a list haha. 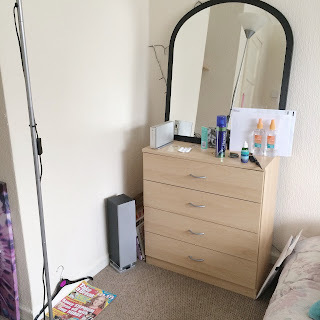 I wanna add some sort of organisation feature onto the wall to make it look more nicer, but just not sure what exactly yet, this is where Pinterest comes into it......I get most of my inspiration from this site. Do you have a desk area, or special place where you blog from?